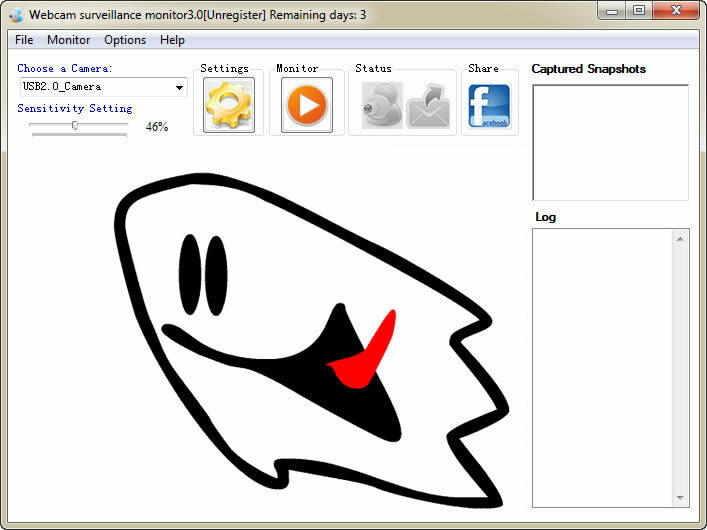 Webcam Surveillance Standard provides Customizable Alarms like Audio Recording, Music Songs, and 3 kinds of default alarms. Also your can reset the Volume by mouse click or drag. The Sensitivity Setting helps you to configure the sensitive degree of your video surveillance system. And the Snapshot setting supports customizable path which is used for saving Activated Snapshots. You can also preview those snapshots in the Log area on the main board. Webcam Surveillance Standard lets you take advantage of the potential of PC based video surveillance. Warning with customizable sound alarms. Capturing every motion details when they happen. Use IP camera to monitor the target far away from you. Timestamp records the precise time of events. Neatly designed interface, easy to follow. Abundant running experiences on Windows 2003, XP, Vista and Win7. Build up video surveillance system with only webcam and PC. Recent Changes: fix some bugs on clicking options and sound alarm selections.